Wild morning, pretties! 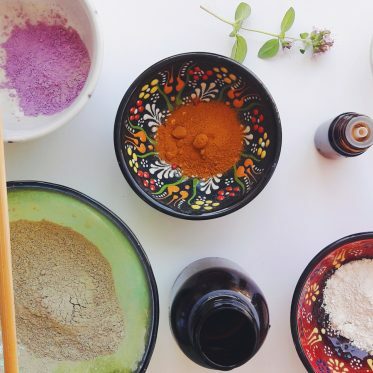 Today’s focus is on vegan and natural DIY cosmetics. Why? Well, I got a package with goodies and I wanted to share some of my projects with you. That’s why we’re making a homemade lip balm, without any beeswax or anything funky. Ready? Let’s get to it! How to make your first vegan homemade lip balm? Fairly easy, if you have all the ingredients already on hand. If you order and wait for all your ingredients, the process itself is still very easy. I made quite a few lip balms this week, all presents, of course. There was a time I used to be crazy about lip balms; different types, different color, smells, flavors. Then I sort of lost and used all of them and then I realized that it’s the easiest way that can get me into my own DIY cosmetics lifestyle is actually an innocent, fragrant lip balm. And it actually and really is! I’ve talked a lot about coconut oil a lot already, it’s one of my favorite ingredients to use at home at all times! Lately, coconut oil became a crucial ingredient in many of my DIY cosmetics recipes, so it was no wonder I’d use it to make homemade lip balm as well. Coconut oil is anti-inflammatory, antibacterial and antifungal. It soothes dry or irritated skin and it’s a perfect natural remedy for cold and harsh winters. Even since I got accustomed to shea butter, I started using it for everything (except for the hair, remember the recipe that went wrong?). the other day I burned my fingers on the stove and applied it to the burnt area, as I had nothing else at home. Guess what! The ache went away fairly quickly and my fingers were healed by the following morning. Shea is the best! Anyway, besides this awesome experience, shea butter is also highly moisturizing. 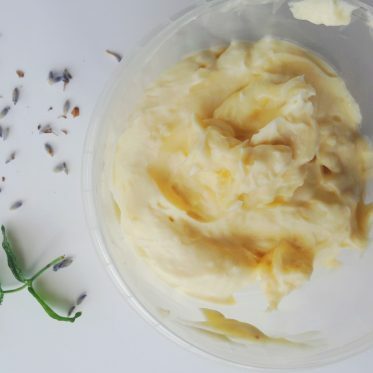 Not only it reduces inflammation, it also makes your skin smooth and soft (as it did in my homemade body butter, whipped and delicious!). 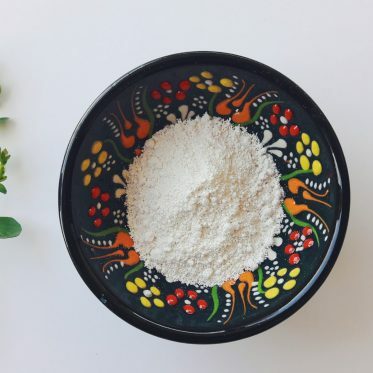 It offers a relief to itchy skin, boosts its elasticity and it is definitely an excellent ingredient for any type of DIY cosmetics, especially lip care. Candelilla wax is a plant-based wax, a vegan substitute for beeswax. It is derived from a shrub called Candelilla, which is native to northern Mexico and the southern USA. In my recipe it worked great, it helped to solidify the texture of my homemade lip balm and it is also easily absorbed into the skin. 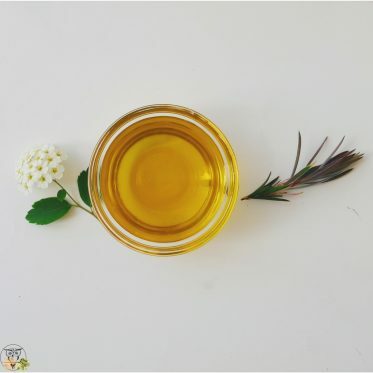 Here you can find a more detailed guide to how candelilla wax behaves when using it for DIY cosmetics recipes. With its monounsaturated fatty acids, avocado oil hydrates and softens the skin. 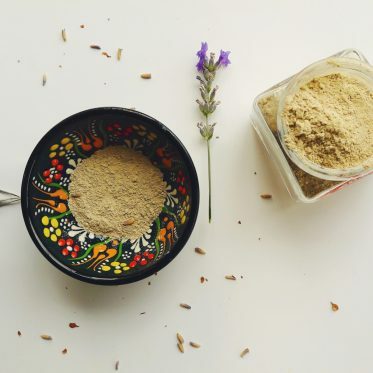 It is a natural remedy for skin inflammation, supposedly aids with acne and calms itchy and dry skin. Chapped lips or dry scalp: avocado oil can aid in all that and more because it also boosts the elasticity of the skin and helps with dark circles. You can find other avocado benefits here. Yes, it’s citrus month (or a decade, really). Bergamot essential oil is one of my favorites to add to any kind of DIY cosmetics, either to this homemade lip balm, a deodorant or a body lotion. Why? Well, I love the smell, which is obviously the most important thing for me (smell first, benefits later). It is a natural relief for stress; it helps me relax after I’m done with all the daily chores and to-do lists. Apart from the smell, clary sage is anti-inflammatory and it is beneficial for both dry and oily skin because it balances the natural oils in the skin. 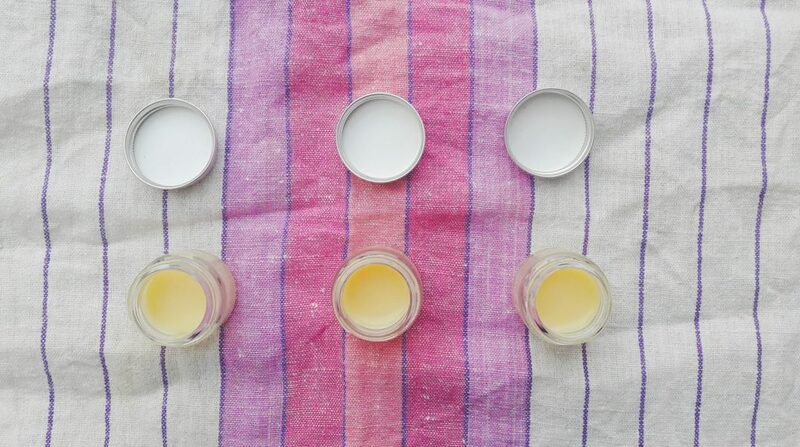 When making your first (or second) vegan homemade lip balm, you need about 15 minutes from the beginning to the end. Make sure to add essential oils and avocado oil at the very end. And try not to get any water into your boiler (as I stupidly did). Add coconut oil, once the shea butter is almost melted. Once you get a golden liquid (as in the photo), your mixture is ready. 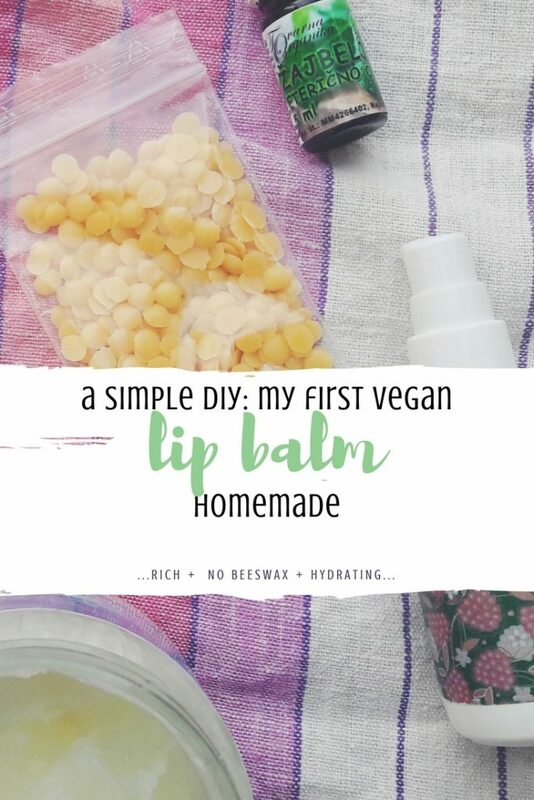 Enjoy your vegan homemade lip balm! What’re your favorite DIY cosmetics for winter?